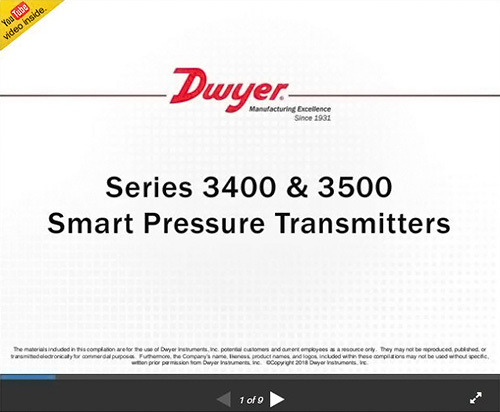 The Series 3400 Smart Pressure Transmitter is a microprocessor-based high performance transmitter, which has flexible pressure calibration, push button configuration, and is programmable using HART® Communication. The Series 3400 is capable of being configured with the zero and span buttons (a field calibrator is not required for configuration). The transmitter software compensates for thermal effects, improving performance. EEPROM stores configuration settings and stores sensor correction coefficients in the event of shutdowns or power loss. The Series 3400 can be configured to be ATEX or IECEX approved for use in hazardous (classified) locations. The rangeability allows the smart transmitter to be configured to fit most applications. Compatible gases, steam, liquids or vapors. Up to 100:1 turn down. Ambient: -40 to 185°F (-40 to 85°C); Process with -DS: -40 to 400°F (-40 to 204°C). 16 to 480 ms (programmable). Packing gland M20x1.5, two 1/2" female NPT conduit, screw terminal. 1/2" female or male NPT.